solar cooking has become the means to having a hot cooked meal most days, and has ultimately become the means by which they are able to afford basic food staples as opposed to spending their scant resources on cooking fuel.. Solar cooking has also become a great time saver and an important factor with regards to personal safety for many of the millions of refugees in Africa, Asia and elsewhere. Worlds largest Solar Kitchen in India. With the ability to solar cook, many women and young children are not as prone to scavenge and search in dangerous areas for limited firewood sources, far from the refugee camps. A solar cooker also allows them to conserve more of their meager funds (if any) to purchase fuel in the form of charcoal, kerosene, or gas thereby retaining more money for the purchase of food staples. Through the availability of inexpensive solar cookers many of the worlds poor are, for the first time in their lives, able to enjoy a small bit of economic stability and a little more sense of personal security and well being by knowing they don't have to struggle so hard just to survive. World wide, there are a number of organizations and individuals who have accomplished much among the worlds impoverished by bringing this means of harnessing a valuable, yet free energy resource to the hands of these needy souls. 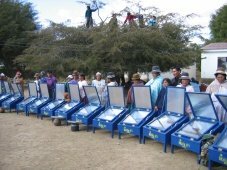 In deference to these organizations, I have taken up a small part of the overall cause, and in my own way have worked to educate, inform, and instruct others within my own community and beyond about the necessity and benefit of adopting solar cooking as a viable and necessary alternative for use by people every where. Including right here in the United States. In fact I personally feel that we can and should become an example to the rest of the world by greatly increasing our own use of this excellent tool, even to the level of institutional application, in due course. Some may argue that; we here have no real "need" of using such a trite and insignificant form of alternative energy when, there are more impact full ways of harnessing renewable resources, such as solar panels or wind generators. But I suggest that every effort helps! Especially when it has to do with something so fundamental and as widespread as the preparing of daily meals. As for me I will continue to work my small part of the garden in hopes of touching the lives of others for good with this unique God-given gift and opportunity. 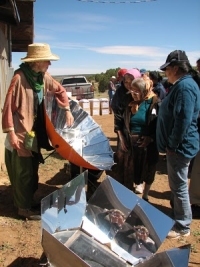 Read about our Navajo Reservation Solar Cooking Project we did in June of 2012. As more and more people here in our country are educated on the possibilities made available through this exceptional method of cooking, then much more can be accomplished in parts of the world with a real and urgent need. ...I would therefore like to introduce you to a handful of the people and organizations that have already made a difference in the lives of many through their efforts to bring solar cooking to the world. ANE (Adopt a Native Elder) Working on the Navajo Reservation. *Besides the obvious benefits to mankind and the environment of living in a sustainable manner, there will come a time when alternative means of “doing and living” will help us to better confront and deal with periods of disaster, trouble, unrest and scarcity. Read this article on the worlds largest Solar Kitchen in India. Ya'at'eeh, I work at Diné College and we are looking for ways to help community members cook food without using propane. I noticed in one of the comments you mention teaching Navajo how to use solar ovens. What were the results? What would you recommend during the windy season. We may purchase a solar oven to demo to students. Yes, we and the organization, Adopt-a-native-Elder, have helped quite a few people on the reservation learn to solar cook . 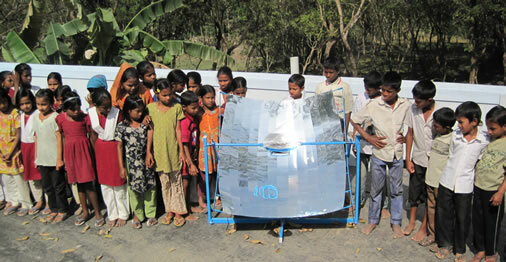 And, there are those still using and getting a lot of benefit from their solar cookers. Wind can be overcome when solar cooking, of course if it gets over 40 miles per hour then that is a bit too much, but we have been able to cook on pretty breezy days, all it requires is a bit of stabilizing the cookers with bricks or some sort of weight or blocks. The new Sun Ovens we carry now are even more wind stable than before. With a solar cooker you can cook dry beans, cook roasts, chickens, veggies of all kinds, rice and pasta and even do some baking. I carry and use a small solar cooker (which I keep in my car) to cook and heat up leftovers of stew, chili, tacos, casseroles, pizza, frozen burritos, pot pies and such for my lunches almost every day (sunny days of course). The time required to heat things up is not too much. Most things are heated up in an hour or less depending on how much food I am heating/cooking. ovens have over panel style cookers. We had our coldest winter in the last forty years here, -5 below, which is unusual for our area and the day after the (unusual snow storm) I had my three Sun Ovens out cooking without a problem. We have customers all over the New England States and Canada that solar cook in the winter on the sunny days they do have. Also check out our Facebook page for lots of winter, and year round, solar cooking posts etc. Throughout our website you will find lots of helpful information and shared stories from people all over who solar cook at all times of the year in all kinds of places around the world. I hope this is helpful, and if you need to know any more, just let me know.